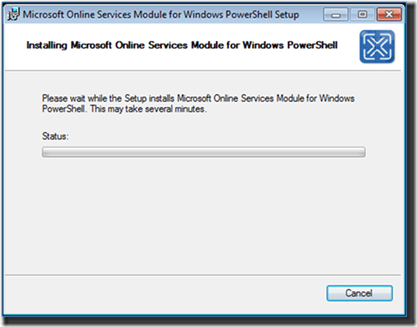 Roll on SharePoint 2013 Foundation is all open can say it seems! 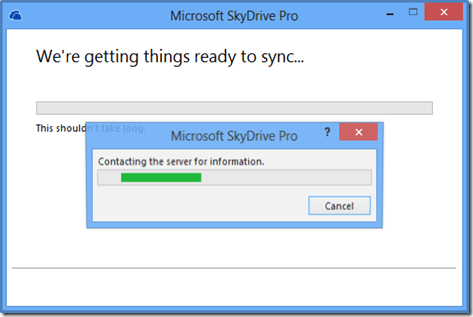 There is a lot of confusion around about exactly what SkyDrive Pro is. Here’s what I’ve been able to deduce. 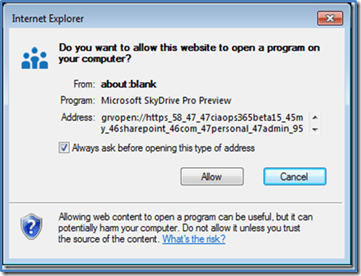 – Skydrive Pro is part of SharePoint 2013. 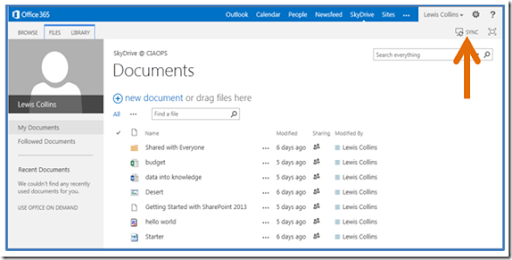 – It allows synch’ing of nominated files in SharePoint 2013 to the desktop. – It is designed as a per user solution, it not designed to bulk sync information from SharePoint 2013 to a network share (a al Dropbox). 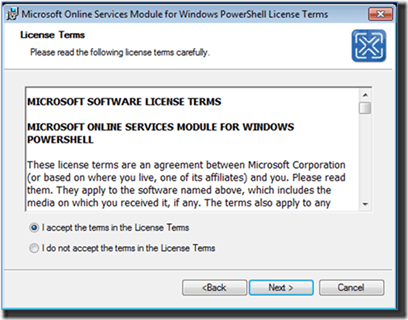 – It requires you to have Office 2013 installed to work. – It is completely different from SkyDrive Live consumer product. So how does it work? 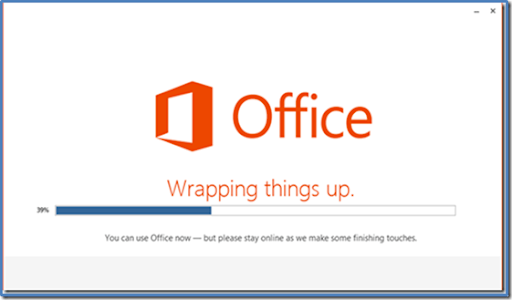 Here’s the experience with the latest Office 365 beta. 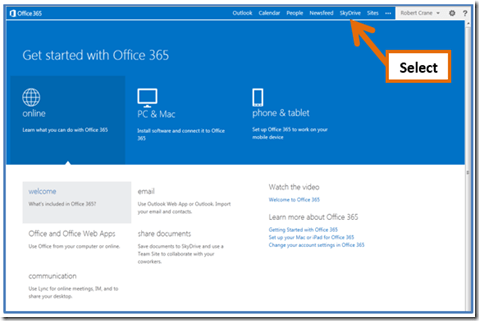 Login to the Office 365 beta portal and select SkyDrive from the menu across the top. Select Sync in the top right of the page. When you do you might get the above inability to display the page with a URL starting with grvopen://https. This is because there is no local app that can do the sync’ing. I would have thought that this piece of software would simply download automatically if it wasn’t found on the local machine. Unfortunately it doesn’t appear so. 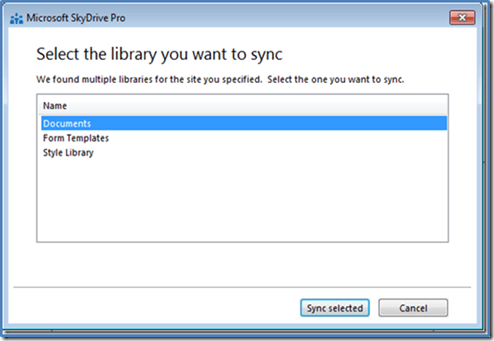 To use SkyDrive Pro sync’ing you need to have Office 2013 installed. 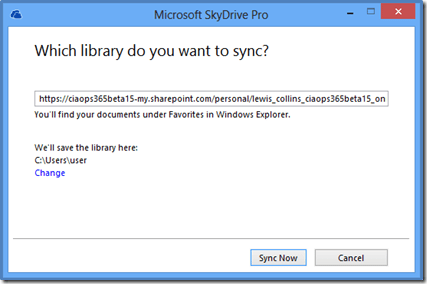 Thus, the SkyDrive Pro sync’ing desktop app appears to be part of Office 2013. You should now see the address of the document library in the library to sync as shown above. Press the Sync Now button. 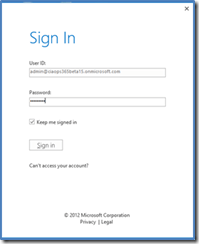 If you are using Office 365, as I am in this case, you may be prompted to login to Office 365. You should now see any files being sync’ed as shown above. So any files copied here will be sync’ed with the location in SharePoint and any new files that get loaded into that SharePoint location will be sync’ed locally in this location. 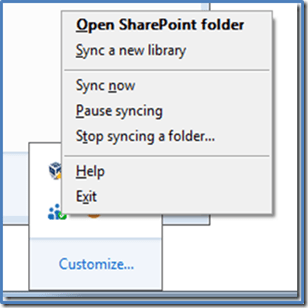 Now, if you go to any document library in SharePoint 2013 you will again see the option to Sync. Selecting that will prompt you, as above, as to what you want to sync. Make the selection and press Sync selected button. You will now see that new sync’ed location added under favourites. Interestingly it will be given a new name as shown above. If you look in the system tray you will find a SkyDrive Pro icon. Right mouse clicking will display the above menu. One would expect that if this icon is shown in the system tray sync’ing to SharePoint 2013 will not happen. 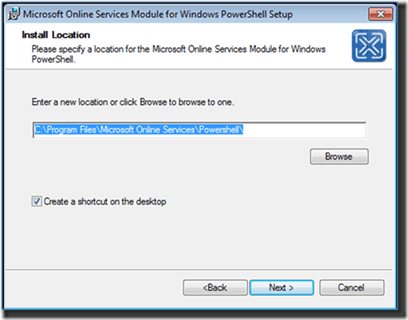 If instead of Office 2013 you have Office 2010 Professional Plus installed, when you attempt to sync it will use SharePoint 2010 Workspace. Thus, if you have Office 2010 Professional Plus you won’t get the SkyDrive app. 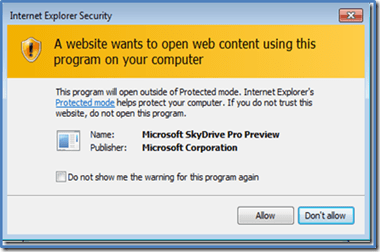 The main question I have now is, can I download just the SkyDrive Pro app somewhere and use it without Office 2013? One kinda thinks that this is what will happen as most people won’t have SharePoint Workspace and, at least initially not Office 2013 either. 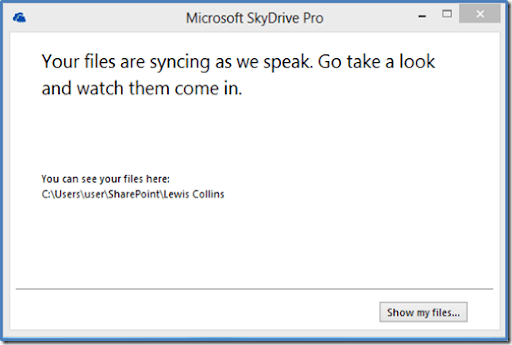 With sync’ing of documents from the cloud to the desktop being very important I certainly hope the provide this SkyDrive Pro Desktop app for free as they do with the consumer grade SkyDrive Live local app. If I find more information I’ll post it, but don’t forget this is still beta software, yet to be released. Sydney and Melbourne Office 365 bootcamps are now complete and I would just to thank all who attended and provided feedback on the event. It all helps me improve what is offered. I will also note that I am scheduling another Office 365 bootcamp in Brisbane on Friday the 26th of October and the registration site for that will be available very soon. Look for for upcoming advanced Office 365 bootcamps and new SharePoint training coming soon. I am joined in this episode by SBS MVP Dean Calvert who gives us his wealth of experience in maximizing your relationship with vendors, especially someone like Microsoft. Working successfully with vendors is all about developing and maintain relationships so some and learn from one of the best. but you can also subscribe there as well using your favourite podcasting app. I’d also appreciate a Facebook like at – https://www.facebook.com/n2kpodcast if you can. Remember, I am always on the look out for guests to appear on the podcast to discuss business and technology topics. If you are at all interested in appearing please contact me directly (director@ciaops.com). Likewise, feel free to send me any feedback you may have about this or any episode, I’d love to hear from you. Once you have downloaded file run it as an administrator. 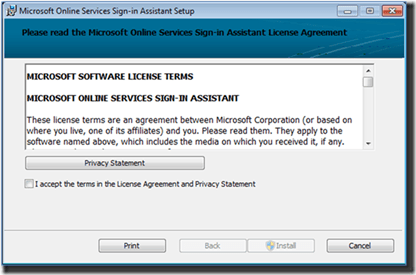 Click the option to accept the license terms and press the Install button. Allow the files to be installed. Click the Finish button when complete. 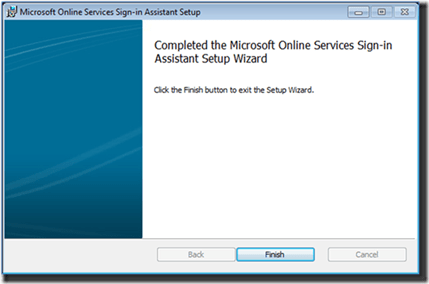 To check that the assistant has been installed correctly navigate to the services on the machine via Start | Control Panel | Administrative Tools | Services. 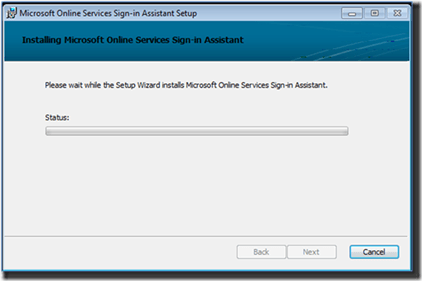 Ensure that the service Microsoft Online Services Sign-in Assistant is present and started as shown above. When complete close the services window. Once downloaded, double click on the file to install. Click Next to commence the installation. Accept the license agreements and click Next to continue. Select a location for the installation on your local machine and press Next to continue. Press the Install button to commence the installation. The files will now be installed to your local machine. Press the Finish button to complete the installation process. 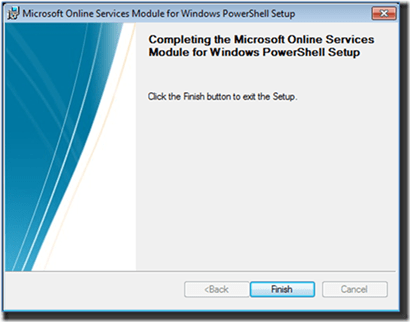 You should now see a new desktop icon like shown above – Microsoft Online Services Module for Windows PowerShell. 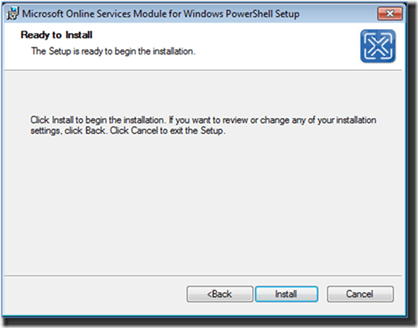 Double click the icon to launch Powershell. You should now see a command prompt like shown above. This is different from the normal command prompt and can be denoted by the initials PS at the beginning of each line. 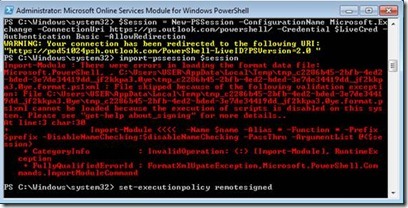 In this case set the section policy as shown above and re-run the powershell command that generated the issue. 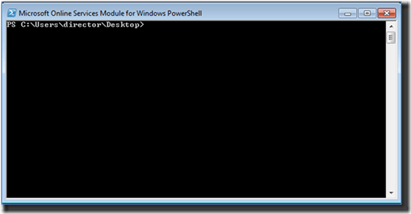 At the command prompt type the following lines followed by the ENTER key. 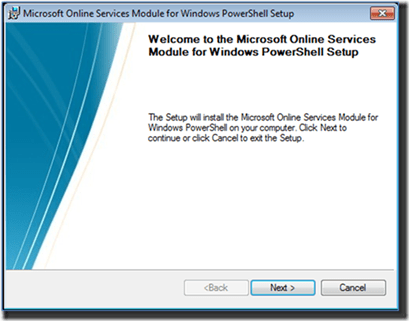 This will load the Microsoft Online Powershell commandlets into the environment so they can be used. It is normally already loaded when you run this, however it is good practice to ensure that it is loaded in case you ever launch just the standard Powershell environment. 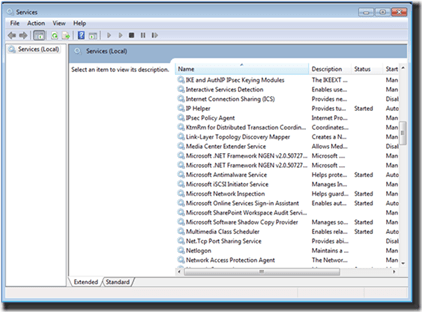 You next need to capture the credential with which you wish to login to the Microsoft Online environment with. To do this enter the following command to assign the credentials to a variable $cred. 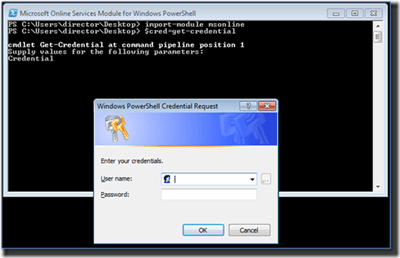 This command will pop up the credential request window you see shown above. You need to enter the login to the Office 365 environment from which you wish to run these command. This will generally be an administrator. 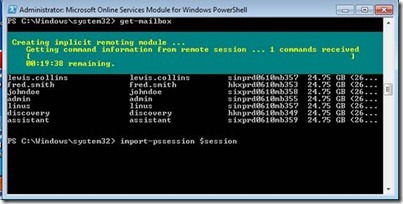 Once these command are complete you are ready to use Powershell with the Office 365 environment you have logged into.